Absolutely chuffed that Johnny the Friendly Lawyer has popped up with this particular contribution. He’s another who has contributed to both blogs on numerous occasions offering his views and thoughts on many a posting. And unusually for an American legal eagle, he’s never once invoiced me!!! 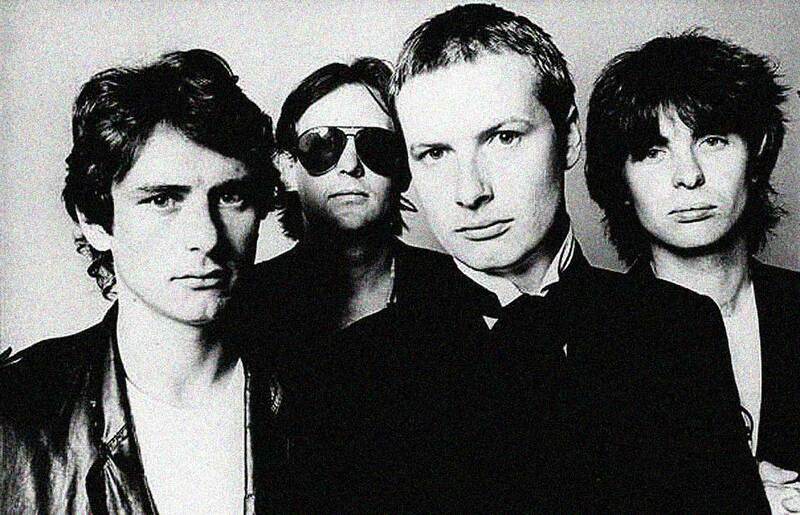 Of all the UK post-punk bands that should have hit it big in the States but didn’t—The Jam, Elvis Costello, the Bunnymen, Smiths, Magazine, and countless others—Swindon’s XTC are among the most criminally overlooked. Maybe it’s because they stopped touring in 1982, when principal singer-songwriter Andy Partridge was overcome by stage fright. Maybe it’s because they didn’t get the label support they needed from Virgin. Maybe it’s because American radio was then and remains to this day absolute crap. In any event, the reason is NOT because XTC didn’t have the tunes. And the man responsible for some of the band’s best tunes is founding bassist and co-vocalist Colin Moulding. Partridge fronted the band and wrote the majority of its songs, including some all time classics (‘Senses Working Overtime’, ‘Respectable Street’ and ‘Mayor of Simpleton’ come to mind). But the less quirky, unprepossessing bassist wrote more than his share of classics. This imaginary compilation offers a modicum of recognition to one of the most unsung heroes of the era, Colin Moulding. Although the band had been around for a while and had already released two albums, XTC really clicked into gear when original member Barry Andrews jumped ship to join Robert Fripp and his League of Gentlemen (decamping soon thereafter to form Shriekback). In came guitar wiz/fellow Swindonian Dave Gregory and XTC’s two-guitar, pop-focused sound was nailed down. 1978’s White Music and Go 2 contained several Moulding songs, but nothing that compares to this masterpiece. It was released as a non-album single in 1979 but was included as the lead track on the American version of Drums and Wires, the band’s 3rd LP, but first minus Andrews and plus Gregory. Instantly catchy like all good pop songs, ‘Hop’ is the true beginning of XTC and the perfect re-introduction of Mr. Moulding. Another single and the opening track of the UK version of Drums and Wires. One of the band’s best known and loved songs, but what is it about, exactly? Parents planning their child’s future? A comment on English society’s emphasis on steady employment? Never been able to work that out, but I do love this number. Interesting to note that ‘Nigel’, ‘Life Begins at the Hop’ and the Moulding-written ’10 Feet Tall’ were all included on the American release, and were the only singles from the album. XTC are, for lack of a better word, a singable band. This track, also from Black Sea, only has a few chords but the vocal line is so melodic it makes the song irresistibly catchy. Even the middle eight (“Mouse takes the bait…”), with its standard C-G-A-D progression, sounds fresh with Moulding singing lead, as he does on most (but not all) of the songs he wrote. The second single from the band’s 5th LP, English Settlement. XTC have often been called ‘Beatle-esque’ and it’s sort of true with this track, which to my ears bears a passing resemblance to ‘Getting Better’. One of the charming things about XTC, for us in the colonies anyway, is how profoundly English they are. Maybe that’s the reason they never made it over here. I don’t know—I hear the opening line “People rushing round with no time to spare” and it reminds me of millions of people, swarming like flies round Waterloo underground. The pace of the song, the intricate guitar figures, the vocal melody—all these show a band at the top of its game. But, soon after this record, Partridge shut down the touring machine, drummer Terry Chambers left, and they lost the plot. It took them years to get it back. Four years and two more albums to be exact. XTC released Mummer in 1983 and The Big Express in 1984, both of which sank without a trace. ‘Wonderland’ was a Moulding single from Mummer which many people liked (not me). But XTC found their feet again in 1986 with the brilliant, Todd Rundgren-produced Skylarking. Often described as a ‘pastoral’ album, Skylarking is terrific start to finish. Widely considered Partridge’s tour de force, the LP nonetheless contained four great Moulding tunes, including this one, the album’s lead single. “And here’s yer other album single”, as our host might say. Little known fact: XTC made headlines with the controversial Partridge tune ‘Dear God.’ It’s a great song with an interesting video to match, but it first came out as the B-side to Moulding’s ‘Grass.’ It was only after U.S. college radio stations picked up on the song that it got its own single release, eventually replacing ‘Mermaid Smiled’ on later pressings of the LP. More trivia: the drummer on Skylarking was Prairie Prince, the original drummer of American corporate rock perpetrators Journey and later a member of art/glam/goof band the Tubes. Second single off Oranges & Lemons, whose title I only recently learned was from an English nursery rhyme. Notice how we’re up to song 9 of the Moulding compilation and seven of the tracks were singles? Not bad for the band’s auxiliary songwriter. Here we are at the end of the set and I’ve yet to mention how great a bassist Moulding is! If it wasn’t obvious from the previous tracks it should be from this one, on which his melodic, fretless lines are themselves little songs. Had Moulding never written a note or sung a word, XTC wouldn’t have been complete without his exceptional bass-playing. I bought my first bass in 1980 at aged 17, and Moulding quickly became a personal hero, ranked only behind the remarkable Graham Maby (from Joe Jackson’s band) and the all-time best bassist of the era, the Attractions’ Bruce Thomas. XTC followed Oranges & Lemons with Nonsuch in 1992, then went quiet for seven years, eventually releasing Apple Venus and Wasp Star in 1999 and 2000, respectively. Then they packed it in. Moulding wrote songs for all of the last three albums, but none, I think, that merits inclusion in place of any of my chosen ten. Haven’t a clue as to what Mr. Moulding is up to now. Indulging their 60’s psychedelia fetish to the extreme, XTC released an excellent EP and LP under the pseudonym The Dukes of Stratosphear. What In The World? ?…, written under the name The Red Curtain (Partridge called himself Sir John Johns) appeared on 1985’s 25 O’Clock, his bass front and center in a McCartney/Taxman bounce. The Dukes returned in 1987 with Psonic Psunspot, on which Moulding/Curtain’s Vanishing Girl appeared. The Dukes’ two releases were later compiled together as Chips from the Chocolate Fireball. This kitschy homage to Barrett-era Pink Floyd, the Beatles and the Beach Boys contains some of the band’s best work and is well worth a listen. I’m a big fan of Colin Moulding’s contribution to the XTC cannon. While both ‘Mummer’ and ‘Big Express’ are not their best work, two of Moulding’s contributions to those two albums are the highlights – ‘Deliver Us From The Elements’ and ‘Wake Up’. You’ve made this Yank proud. The Moulding angle was a smart one. Otherwise, you’ve got a Clash problem on your hands and you start pulling your hair out. My first thought was that you have to include something from White Music or Go2. I’m a huge fan of the Barry Andrews era. Upon closer inspection, you were correct. He hadn’t quite come into his own yet. The manic Cross Wires was the only Moulding song I could even come close to considering, and I don’t think that one warrants a bump of one of your choices. Completely on board with ending this thing at Oranges & Lemons too. Have you ever heard the King for a Day demo on Coat of Many Cupboards? It’s amazing how far the fellas advanced that one. Finally, great plug for Dukes of Stratosphear. Vanishing Girl might just be the best of this lot. I didn’t know this band… And man, do I repent. JTFL – Glad to see more love for Colin Moulding and his contributions to XTC! Your Imaginary Compilation reads like one of my walkman cassettes which got be to college and work in Manhattan back in those years! I’m just really glad I got to see XTC on their Drums & Wires era tour and their last tour for Black Sea. That last show at NYC’s Palladium is etched in my memory and I still have my yellow and white XTC baseball shirt to prove it! A fabbo selection, but I can’t conceive of missing the crucial track from “English Settlement,” the riveting “Runaways.” Also love for The Colonel single from these quarters, though technically not XTC. @ PPM: tough call on ‘Runaways’, but that’s the challenge of these imaginary comps. @ Echorich: That Palladium show is legendary! So jealous! Got to say that I love XTC, and I’m from Swindon too. When 3D EP came out I was apart time DJ and frequented a great record shop in town called “Flashback Records” and the owner had an idea of my taste (punks and eclectic new wave) and he’d frequently order stuff in for me. He played me 3D EP and I fell in love although knew nothing about the band. I used to DJ for my school’s social club and would always turn up early so to play the records I really liked at a volume that really appealed (if it’s too loud, you’re too old) and the school caretaker wandered in to the hall – like most school caretakers the best years of his life were behind him and to me, a mere 17 year old he seemed really ancient. When I’d finished playing 3D EP he came to the stage and asked whether I liked what I’d just played. I said I thought it was great and he said “That’s really great because my son’s on there). I knew him as Chas Moulding and checked the sleeve and low and behold – there was Colin. Anyway, XTC used to dress up and play regular Christmas gigs in town (and others too) and I never missed one – until AP retired from gigging (just realised that we share the same initials, how wierd). I don’t disagree with these great Colin songs but…………… Down a Peg!! !